Today we have a winner and excerpt of Saloma Miller Furlong’s memoir, Why I Left the Amish. Thanks to all who participated and a special thanks to Saloma for taking the time to respond to everyone’s comments. There were some very interesting discussions. If you missed the original interview you can read it here: Saloma Miller Furlong interview. Congrats, Christine. Please send a physical address where you’d like your book sent to amishamerica@gmail.com, and Saloma will get that out to you. I couldn’t sleep all night. I tried not to toss and turn or wake Sarah, who was sleeping in the same bed. I kept thinking about the little suitcase only a few feet away, behind the closet door. I played the scene in my mind over and over. I’d wait in my room, in my gray dress, coat, white scarf, and boots until Mr. Pell drove into the lane. Mem would certainly announce when he came. Then by the sound of her voice, I would know whether she was in the living room or the kitchen. If she was in the living room, I would go quickly through the kitchen and out the door before she discovered I had a suitcase in my hand. If she was in the kitchen, I would tell her I was babysitting overnight at the place where I worked. This would also give me the extra day I needed to get out of town before anyone found out that I was gone. I got up earlier than usual, but not so early that anyone would suspect. The yellow car drove in. Mem announced it from the kitchen. I went quickly down the stairs and came face to face with her. She was sweeping around the table, but she stopped and looked pointedly at the suitcase in my hand. “I won’t,” I said. I went quickly down the steps and out the door before she could call me back. As Mr. Pell drove out the driveway past the kitchen window, I saw Mem looking out at me. Without thinking about it, my hand went up and I gave her a wave. I wondered if I would ever see her again. I knew it would be really hard for her when she found out that I had left. I also knew that if I started feeling sorry for Mem, I would not be able to leave. The car kept going. I was not running away blindly, I told myself. I had made plans and had money. I would be all right. 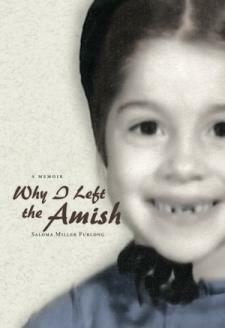 You can purchase Why I Left the Amish from a variety of sources, including Amazon and Saloma’s site. Congrats Christine, I’m sure you will enjoy reading this! Congratulations Christine! It looks like you are in for a good read. Judging from the excerpt, Saloma is an engaging writer. Thanks for posting that Erik. I hope everyone has a great day. Today was your lucky day! Having read the excerpt, I’m even more anxious to read the entire book. I wish you well, Saloma, and will be looking forward to reading any future books you author. I never win anything! 🙂 I can’t wait to get it! Erik, thank you for posting the interesting interview with Saloma. I’m happy to see hers and Ira Wagler’s book giving more accurate portraits of the life and culture rather than those that idealize it. Saloma, thank you for sharing your story through the book and the interview.